Yamaha, winning the Volvo Round the World Race. This fine marine painting, measures 76 x 121 cm (30″ x 48″), oils, is available, terms on request. 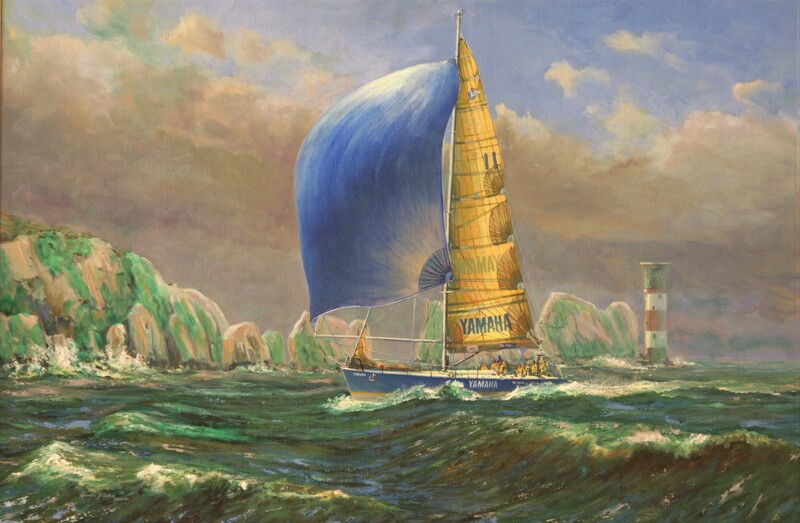 Mitsui-Yamaha (GB), sponsors of this Whitbread 60 class yacht wanted a commemorative painting. 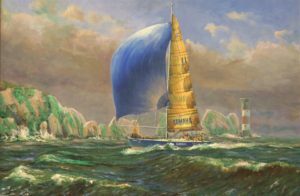 First past the Needles; as the yacht Yamaha passed the Needles her professional crew knew for certain they had won the Whitbread round the world race and Heineken Trophy. At a meeting in London they chose Gordon Frickers partly because of his “ Ice Maiden ” painting (see Print Gallery). As the yacht approached England Gordon Frickers had to rush to Southampton to interview the crew and see the yacht. I produced two paintings 30″ x 48″ in 4 weeks. The client chose Yamaha “First Challenge – First Victory” saying it was a more traditionally ‘British’ scene so would look excellent hung in the Yamaha boardroom in Japan. This picture has remained in the my collection, an excellent ‘exhibition piece. It was for many years loaned to the Mountbatten Watersport Centre, Plymouth and is now offered for sale, your chance to buy a piece of yachting history. Today (2017) the yachts have developed into the Volvo Ocean 65s. Credit where it is due: Special thanks to the directors of Mitsui-Yamaha (GB) for the inspiration and the command. A fine marine art for sea orientated people, a timeless painting will give you pleasure every time you see it upon your wall.